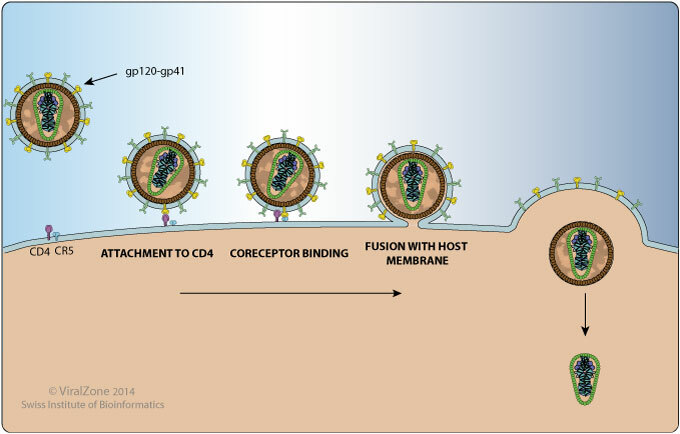 Gp120 attaches the virus to the host cell by binding to the attachment receptor CD4. This interaction induces a structural rearrangement creating a high affinity binding site for a chemokine entry receptor like CXCR4 and/or CCR5. HIV-1 CCR5 strains predominate in the early stages of disease, while CXCR4-using strains correlate with an increase of disease progression. The envelope spike is composed of trimers of gp120/gp41 heterodimers. Interacts with CD4 to allow virus attachment. Interacts with CXCR4 and CCR5. Interacts with DC-SIGN on dendritic cells. 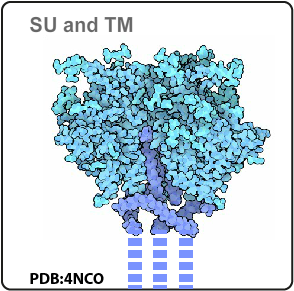 Antiretroviral Drugs Fusion inhibitors prevent fusion and entry of HIV into target host cells by interacting with the viral glycoprotein gp41 and forming a blockade between virus and host cell membrane binding.